BJP prime ministerial candidate Narendra Modi addressing an election rally in Dhemaji, Assam. Dhemaji: Narendra Modi has alleged a conspiracy to eliminate the endangered rhinoceros in Assam to make way for Bangladeshi settlers. He accuses "people sitting in the government." Assam is ruled by the rival Congress. And he also warned that the poaching of rhinos would not be tolerated, "Those who are conspiring to finish off rhinos, they should listen to this carefully. After May 16, they will be taken to task one by one (chun chun ke hisab liya jayega)." 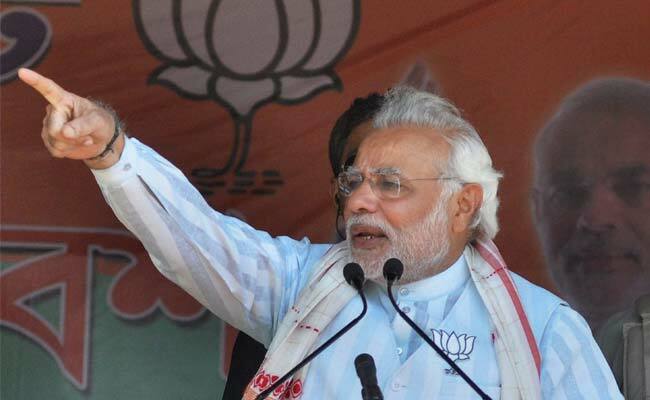 A number of opinon polls say Mr Modi is the frontrunner for the top post of PM. "We have to save the future of Assam. It is our responsibility to save it from forces which are looting the state," he promised. The BJP leader also said local people increasingly faced unemployment as people migrating from Bangladesh were taking up jobs in India. He said it was the demand of time that these "intrusions" stopped. Assam sends 14 members to the Lok Sabha. In 2009, the Congress had won seven seats and BJP had won four seats mostly in urban centres. The state votes in three phases in elections beginning next month.